You are sitting in your company’s New Product Development governance meeting, excited to finally get approval for development of a new disruptive product in a new market segment. Your company has been promoting the importance of Innovation for years and your manager has emphasized the need to recapture market dominance. R&D and Marketing have worked long and hard together to come up with a new product concept that utilizes new technology, fulfills an unmet consumer need and that resonates with consumers for the predicted price point. You know the idea is dead, never to live again. The next project for consideration, a minor line extension of an existing product, with some new features that many consumers will never use, gets approved quickly and unanimously. The next project, a pediatric version of an adult product with a new color and packaging and proposed for launch in Latin America, is also approved quickly. Welcome to the Age of Incrementalism … This hypothetical case involves a large company struggling to bring innovative new products to market, but the new product development portfolio contains mainly incremental line extensions and product improvements. If you’re a frequent reader of my blog you’ll know that I believe that if the innovation portfolio does not have any “big idea” projects, it’s a warning sign that the company does not have a coherent innovation strategy and that ”innovation collapse” is imminent1. Disruptive Innovation verses Sustaining Innovation … As discussed in my previous post, Innovation can be either “Disruptive” or “Sustaining”. Disruptive Innovation helps create a new market and value network, and eventually displaces an earlier technology. The term also describes Innovation that improves a product or service in ways that the market does not expect, typically first by designing for a different set of consumers in the new market, and later by lowering prices in the existing market. (You may find my case study on Whey Proteins an interesting example of Disruptive Innovation4). On the other hand, Sustaining Innovation can be described as incremental line extensions and product improvements. This is the “incrementalism” Peter Thiel was talking about above. Many large companies now seem to be stuck in a cycle of producing new products via sustaining innovation and the number of disruptive innovations hitting the market seems to be at an all-time low. Maybe the current economic situation is partly to blame for companies being less willing to bet big. However I believe other factors are involved in these companies being unwilling to take on any risk. For example, short term growth goals and associated executive performance targets have increasingly distilled and genericized Innovation cultures, which in turn has resulted in risk-averse NPD portfolio management decisions, and has driven away talent; additionally internal company and external government bureaucracies have complicated the innovative process. Even Apple, once the darling of Innovation gurus, has not introduced a major new innovation since the iPad in January 2010, more than three years ago. SpaceX and Tesla Motors, run by Elon Musk, are notable rare exceptions to this trend and have bet big with new disruptive innovations. 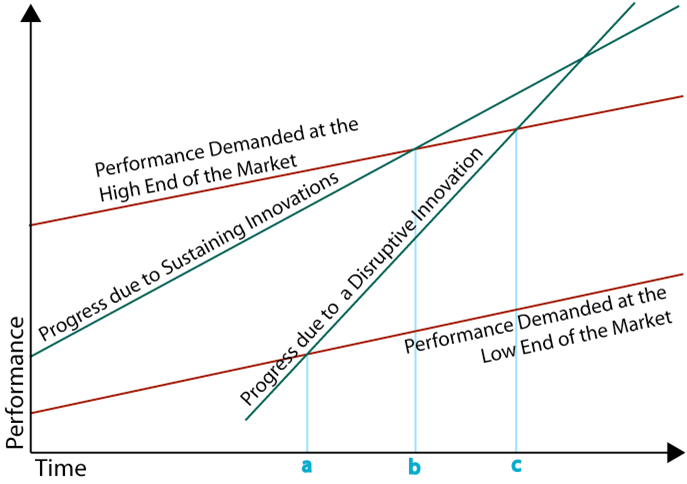 This graph, adapte d from Clayton Christensen’s book, The Innovator’s Dilemma, explains the importance of disruptive innovation and its relationship to sustaining innovation. At point “a”, the disruptive innovation starts to take hold with the low end of the market and consumers start to drop a more expensive existing product being supported by sustaining innovation. At point “b”, the established product exceeds the demands of the most demanding consumers and more consumers are dropping the existing product for the disruptive one. At point “c”, even the most demanding consumers will drop the established product for the new disruptive product for reasons such as cost, convenience or other features that the established product does not have. Eventually the performance of the disruptive innovation will exceed the established product. Are Small Companies better at Disruptive Innovation? … Recently it seems that disruptive innovation has been best executed in small companies. Why is it that innovation has been more at home in small companies than in large companies? In part, I think it’s because the culture of innovation in a large company is very difficult to implement and to maintain. As I’ve commented before, “Most (large) companies are preoccupied with meeting growth targets, especially short term growth targets. These short term growth targets can result in a bias where short term projects are favored over longer term projects even if the longer term projects have a considerably larger upside.“ Startups or small companies are not bound by the same constraints and realize that their only strategy to survive and grow is to launch a disruptive innovation. Where can you Work if you are Interested in Disruptive Innovation? … If you are a young scientist starting out in your career and are interested in working on disruptive innovation then as a general rule I have usually suggested you look for a small company or a startup company. While large companies have launched some disruptive innovations over the last few years, most of the R&D work in these companies has been based on “sustaining” innovation or minor product improvements. While this is important to maintain short term business goals and can be interesting in its own right, if you are most interested in working on something completely new and innovative then a small startup company has probably been a better match. Even so, there were caveats to that advice. For example, many small companies crash and burn and your work never makes it to market. In contrast, large companies, which tend to have more incremental (sustaining innovation) projects, ensure products get to market and tend to have better marketing resources to ensure that these products are successful in the market. Is it too late to Revive Innovation? … Now would seem to be a good time for companies to reinvigorate their innovation cultures and incorporate disruptive innovations in their portfolios. While the recession was a time where sustaining innovations made sense in order to control costs, the economy is recovering and companies prepared to take risks with disruptive innovations may reap large benefits, especially if those products can be adapted for global markets. Markets have a hunger for new disruptive innovations, whether it is an electric car from Tesla with a 200+ mile range, a wearable computer as recently announced by Google, Novartis’s new gene therapy (in development) for cancer that uses a disabled form of the HIV virus, or the Boeing 787 Dreamliner. Wall Street may not be impressed by these disruptive innovations, but I believe the cultures which launched these products may propel these companies to “innovation crescendo” in the next few years. 2. Bloomberg Businessweek January 28, 2013. 4. See previous post “A Case Study for Disruptive Innovation”.